Any building will see a deterioration in its condition if it goes without maintenance for 60 years. That’s the reality with Queensbury Tunnel and of course, unlike your house, this remarkable structure has to contend with significant volumes of penetrating water, localised forces from the ground it is driven through and the impact of adjacent colliery workings. When the tunnel was operational, it was often the focus of repairs; several lengths of its sidewalls and arch had to be rebuilt in 1883, just five years after the first train passed through. But no substantive attention has been paid to it since the section of line from Holmfield to Queensbury West closed to freight in May 1956. In October 2009, consultants working for Queensbury Tunnel’s then-owner, British Railways Board (Residuary), completed a feasibility study into its condition and future management. Produced by Jacobs, this found that the purpose of the tunnel’s lining was mostly to channel water towards the drain and prevent small pieces of debris from falling onto the railway track; it is not intended to hold up the surrounding rock which is, by nature, self-supporting. thirdly at several locations through the tunnel where considerable forces are being exerted on the back of the lining, causing it to bulge. 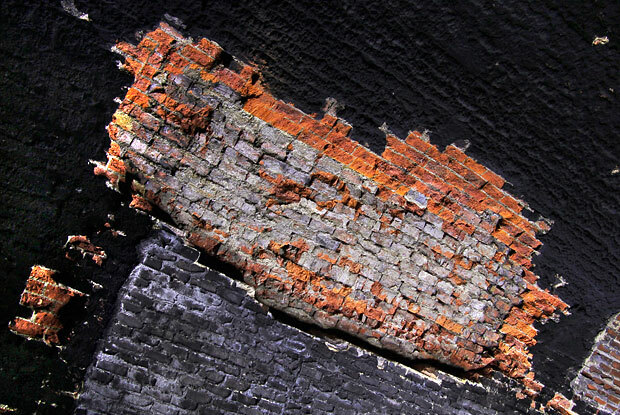 The impact of the latter two issues, allied with the penetrating groundwater, has brought many additional minor defects such as localised damage to the brickwork, mortar loss and some cracking. Most of these are not structurally significant. In 2015, Highways England's Historical Railways Estate (HRE) asked Jacobs to produce another report on options for Queensbury Tunnel. Based on this, it decided to move forward with an abandonment scheme costing about £3 million, involving concrete plugs being poured in the entrances and the seven shafts (five completed, two abandoned during construction) being backfilled. It is this work the Society is campaigning against. It should be made clear to those who live above the line of the tunnel that its current condition should not concern them. The accessible shafts are all in fair condition whilst the tunnel itself - where is passes under habitation - is so far below ground that any loss of its lining would not have an impact at ground level.